Tea roses bluster the half-door. Rain from eaves footfalls the gravel. frittered away all morning in the shrub. I wouldn’t need another single word. Aus Rinnen tritt Regen auf den Kies. vertrödelte den ganzen Morgen im Gebüsch. benötigte ich kein weiteres Wort mehr. Čajová růže bouří u holandských dveří. Déšť z okapů podupává na oblázcích. promarnila celé ráno v křoví. nepotřebovala bych už ani slovo. Vona Groarke was born in 1964 in Edgeworth, Ireland. She studied at Trinity College Dublin and University College Cork. Until 2004 she worked in the UK, USA and Norway. At Villanova University, she held the Heimboldshausen Chair in Irish Studies. From 2005 to 2007 she was Poet-in-Residence at Wake Forest University, Winston-Salem, North Carolina. Her lyrical work includes, among other “Shale” (1994), “Other People’s Houses” (1999), “Flight” (2002), “Juniper Street” (2006) and “Spindrift”(2009). Her poems have been translated into seven languages, including into French, Spanish, Chinese, Portuguese and Japanese. 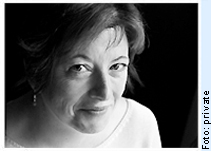 Her poems have been included in 'An Anthology of Modern Irish Poetry' and 'Identity Parade'. In 2010 she was elected to the Irish Academy of Arts, Aosdána. She is the current editor of Poetry Ireland Review.